A transcription is basically a representation of a primary source in another format, such as paper or the electronic medium. Some transcriptions aim to reproduce the source text as closely as possible, others allow for a certain amount of generalisation. In transcriptions of speech, a distinction is usually drawn between narrow and broad transcriptions, depending on the amount of phonetic detail. The same perspective applies to transcriptions of manuscript texts. Close (or narrow) transcriptions are usually referred to as diplomatic, while regularised transcriptions are often referred to as normalised. This is the basic distinction drawn in e.g. Wittgenstein's Nachlass: The Bergen Electronic Edition (1998-200). Here, all texts are available in two versions, a diplomatic transcription and a normalised one. For examples, please refer to this page. We suggest that Medieval Nordic texts may be transcribed on up to three levels. In addition to the normalised level, we identify two closer levels. We shall refer to the narrowest level as the facsimile level, while the "medium" level is designated as diplomatic. The three levels are exemplified in ch. 3.2 below. The distinction between three levels of text representation does not mean that Menota transcription should contain all three levels. Many transcribers will probably choose a single level for their transcription. Our recommendation is to use these levels as a guide, so that a transcription can be described as following one of these levels. This information should be given in the header, and can optionally be given by use of specific elements in the transcription itself, as discussed in ch. 3.2 below. If a transcriber wishes to deviate from any of these levels, and there may be good reasons to do so, we recommend that the deviations are specified in the header. It is convenient to begin by looking at a Latin text example, Passio et Miracula Beati Olavi. An important source for this work is Corpus Christi College, Oxford MS 209, a vellum manuscript from the late 12th century. Below is a low resolution facsimile from the very beginning of the Passio, with an XML-conformant transcription to the right. 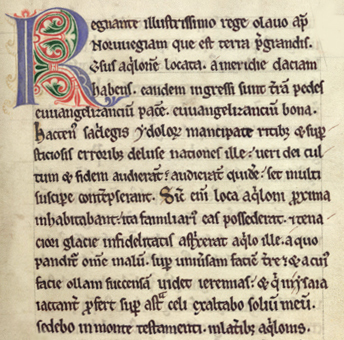 For a facsimile of the whole manuscript in high resolution, please refer to Early Manuscripts at Oxford University. Fig. 3.1 CCC 209, fol. 57r., l. 1-15. Passio et miracula beati Olavi Regnante illustrissimo rege Olauo apud Noruuegiam, que est terra pregrandis uersus aquilonem locata, a meridie Daciam habens, eandem ingressi sunt terram pedes euuangelizancium pacem, euuangelizancium bona. Hactenus sacrilegis ydolorum mancipate ritibus et supersticiosis erroribus deluse nationes ille ueri Dei cultum et fidem audierant; audierant quidem, set multi suscipere contempserant. Sicut enim loca aquiloni proxima inhabitabant, ita familiarius eas possederat et tenaciori glacie infidelitatis astrinxerat aquilo ille, a quo panditur omne malum super uniuersam faciem terre, et a cuius facie ollam succensam uidet Ieremias, et qui in Ysaia iactanter profert: Super astra celi exaltabo solium meum, sedebo in monte testamenti in lateribus Aquilonis. 1. Regnante illustrissimo rege Olauo apud Noruuegiam, que est terra pregrandis uersus aquilonem locata, a meridie Daciam habens, eandem ingressi sunt terram pedes euuangelizancium pacem, euuangelizancium bona. 2. Hactenus sacrilegis ydolorum mancipate ritibus et supersticiosis erroribus deluse nationes ille ueri Dei cultum et fidem audierant; audierant quidem, set multi suscipere contempserant. 4. Super astra celi exaltabo solium meum, sedebo in monte testamenti in lateribus Aquilonis. Here goes structured information on the text and the transcription. Here goes the text as exemplified above. It is important to keep in mind that a transcription may be as straightforward and readable as this, and it would be fully acceptable as a Menota text. Yet other transcribers would like to encode the fact that the word has been abbreviated with a superlinear bar AND that this abbreviation should be expanded as "ud" in this particular context. The superlinear bar is highly ambigious; in this short extract alone, it should be expanded as "m" in "terram" (l. 4), "ut" in "Sicut" (l. 9), "ni" in "enim" (l. 9), "n" in "omne" (l. 12). The more information the transcriber want to put into the text, the more complex it will become. The next chapters will go into more details. We believe that there are three focal levels of text representation for Medieval Nordic texts and suggest that a transcription should reflect at least one of these levels. Furthermore, a transcription should be easily expandable so as to accommodate one or two additional levels. This time, we shall use a short extract from an Old Icelandic manuscript, AM 645 4to (first quarter of the 13th century). Fig. 3.3 Facsimile rendering of the example text in fig. 3.2. Note that the superlinear "i" above "p" in the second line most likely is a mistake by the scribe. At the facsimile level, the transcriber ought to encode the manuscript exactly as it reads, even if it contains obvious mistakes. Corrections can be made by inserting a note, or it can be left to the diplomatic or normalised level. Fig. 3.4 Diplomatic rendering of the example text in fig. 3.2. Fig. 3.5 Normalised rendering of the example text in fig. 3.2. For a more detailed discussion of these levels, please refer to Haugen 1995. The transcriptions in ch. 3.2 each reflect a specific level of text representation. However, we believe that the transcription should be expandable to accommodate more than one level. Here, we shall suggest that two ways of achieving this. We regard both solutions as equivalent, and believe that the choice between them will be dictated by practical considerations. In both cases, we recommend using the <w> element to group each lexical word in the transcription, as explained in ch. 2.3. The elements <facs>, <dipl> and <norm> are not defined in TEI, but is part of the DTD we have defined. Please see the DTD in the tool chest.